Suzanne Bearne visits Philadelphia to discover the world’s first shrine to all things pizza-related. I’m half expecting to hear the theme tune to Teenage Mutant Ninja Turtles as I pull open the door to the world’s first museum devoted to pizza. Set in Fishtown, a gentrifying neighbourhood to the northeast of central Philadelphia, Pizza Brain is not an easy find. I'm wandering across playing fields and forever checking the very rough map I've sketched out before I spot a badly-chipped store front that's in need of a lick of paint. On first thoughts you’d be forgiven if you thought this was quite simply a pizzeria. But as soon as I enter the wood-and-brick restaurant, pizza memorabilia surrounds me. The walls are covered with framed black-and-white and colour pictures and comic books depicting pizza, toys like a pizza-making Ken doll are held in glass cases on the wall and a clock hangs in the form of pepperoni pizza. A black cabinet holds DVDs and VHS tapes of pizza-related shows and films from the Teenage Mutant Ninja Turtles to Killer Pizza. One wall of the seating area in a co-joined room is filled with framed LPs related to pizza, including Snub Mosley Live at Pizza Express. It doesn’t take long to scour the museum; within ten minutes I’ve looked at all the memorabilia. It’s fair to say I’m not more informed about the history of pizza, but it does stir memories of acting out the Turtles in the playground at primary school. But I’m not just here to appreciate the memorabilia. There’s the smell of pizza wafting up my nose and I’m sure not going to come here without picking up a slice. The menu of pizzas, all named after real people, includes a mozzarella, fontina, grana padano, basil and pepperoni pie going by the name of Forbes Waggensense and a Granny Divjack packed with a combination of mozzarella, shaved almonds, caramelised onions, blue cheese and Granny Smith apple. 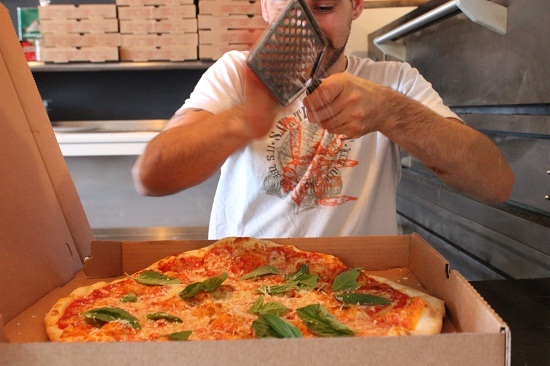 I choose the Leonard Bookman, a mozzarella, fontina, ricotta, black pepper and fresh oregano white pie. In return for $3, I’m handed a bigger-than-your-average slice. I’ve got to admit, the thin-crusted artisanal slice is pretty amazing. And I’ve soon wolfed it down. Of course, no feast of pizza would be complete without ice cream. Luckily, at the back of the seating area, there’s Little Baby’s Ice Cream, an ice cream parlour with a difference. Where else can you find balsamic banana or Earl Grey flavoured ice cream? And just in case you haven’t had your fill of pizza yet, there is of course a pizza-flavoured variety. Free admission to Pizza Brain. Slice of pizza from $3. Whole pizza from $11. It’s open every day apart from Mondays. Suzanne Bearne is a freelance journalist specialising in retail, digital and travel. She’s also a travel blogger and can be found blogging at www.devotedtotravel.wordpress.comand tweeting at sbearne. If you'd like to tuck into an all-American pizza, take a look at our flights to the USA from just £379 to New York.